Mahjong has never been this cute! Big Fish Games is no stranger to taking a classic game and putting their own spin on it, as evidenced with previous titles like Cascade. This time, the game being transformed into something much more enjoyable and modern is the traditional pastime Mahjong, with Panda Pandamonium. It's adorable, fast-paced, and one of the most addictive spins on the traditionally slower titles we've seen yet, and you'll be ready to get your panda on in no time. This isn't your typical mahjong, with your goal shifting from simply clearing tiles from multiplayer layers across the board to saving the lives of adorable little pandas that find themselves trapped between tiles. You need to simply match tiles with the same images on them and work your way across the board to clear out tiles in Panda Pandamonium, but things aren't always going to be that simple. As you progress through the game, you'll find newer obstacles in your way, like unbreakable blocks and tiles with specific elements on them. You can only get rid of specific tiles by placing them next to the element that will conquer them -- for instance, put water tiles next to fire tiles to "extinguish" them. There are also a handful of boss encounters in the form of fights with dragons to keep you busy, and if you get stuck you can always reshuffle the board to make sure you've got access to the most viable matches available. Sometimes, it can be difficult to make the matches you think are right in front of you. Additionally, Panda Pandamonium operates on the typical free-to-play model that allows you three lives per day. Every time you complete an objective, y ou get another life, but when you run out you're asked to buy more or wait until you earn additional lives. 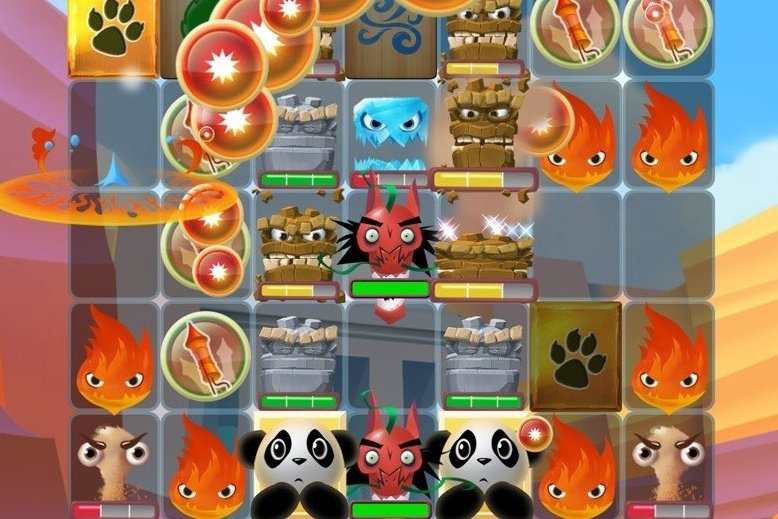 Panda Pandamonium is a fluffy yet substantial update to the classic game of mahjong, and worth a try, especially if you've got the extra income to keep going even when you fail. Big Fish does it again.